If you’ve never done your own box braids, you may think it’s harder than it actually is. Learning how to do them just takes a little time and patience, but once you have the technique down, you’ll be able to manipulate your hair into many different styles. Now this is just one of the many amazing ways to style and wear crochet braids, but what’s great about pretty much any crochet braid style is that your braiding pattern underneath doesn’t have to perfect. Even though I can easily install individual braids, creating tight, clean cornrows has never come easy for me. But if you feel like you just need to have flawless braids underneath and can’t do them yourself, you can also get someone else to assist you in the process. iMadameJay shows how this style can be worn two ways: twisted or unraveled, just like a twistout. Either way, you can’t go wrong! Plus, you can add hair jewelry to your twists to spice this look up even more. These braids are a fun way to switch up your styling. 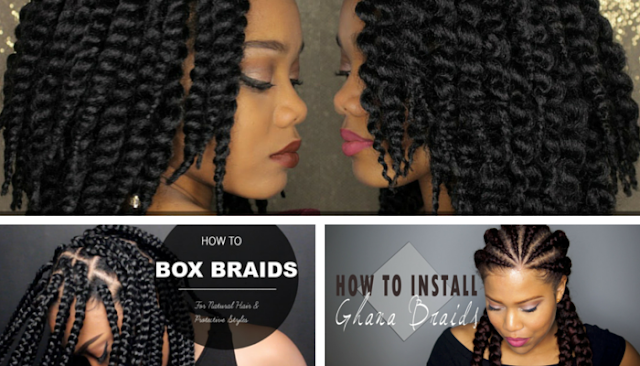 If you like protective styling without the long-term commitment, Ghana braids are great for changing your look for just a couple of weeks so you won’t start missing your curls too much. Plus, they only take a few hours to install, which is always a plus. However, the technique is more suitable for an intermediate/advanced braider, so prepare for a learning curve if you’re doing them yourself for the first time. You can see in this video by J’adoreMyCurls that this style relies heavily on creating the perfect part, so keep that in mind when you begin.